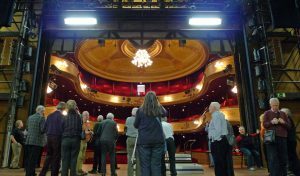 If you enjoy theatre in performance and take an interest in theatre architecture, interior design, stage craft & technology, dramatic history or the social history which theatre buildings of all kinds reflect, then why not join us? Perhaps you have worked in theatre yourself − you would be most welcome. *receive an annual Journal with more in-depth articles. Membership is open to everyone at £25 for single membership and £30 for joint membership at the same address. Click on the link below and post your membership application. Click here for the FMS MEMBERSHIP FORM 2019 in PDF format to download and print. If the form does not open properly download the PDF Reader here unchecking the optional offers if you do not require them. The Frank Matcham Society is grateful for the support given by our Theatre & Corporate Members listed here. Please contact our Membership Secretary if you would like to join them and help raise awareness of Frank Matcham and his work and that of other theatre architects.